Most often found in thick brush areas in and around Southern California, ticks are parasites that attach to their hosts by cutting small holes in the skin and inserting their head and front legs to feed on blood. 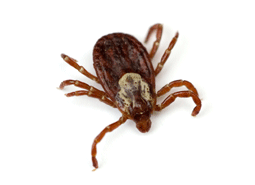 Ticks can attach to, and feed on, both animals and people. Ticks carry serious illnesses and bacteria, making immediate flea and tick control services important for the health of pets and people. For safe tick removal services, on our initial visit, a Knockout Pest Control technician will inspect your property to find the ticks, and will then apply an insecticidal barrier around your property to eliminate ticks and stop them from breeding. For tick and other pest control services, we offer a variety of pest control service packages, including monthly, bi-monthly and quarterly pest control protection packages. Pest control maintenance guarantee year-round pest control. If you experience a pest infestation that is included in your maintenance plan between scheduled visits, we will visit the property to resolve the pest control issue, free of charge. It’s as simple that, we guarantee control.